If you have a promotion code from us, simply enter it on the shopping cart page. Please ensure you are registered with us, otherwise the promotion code will be ignored, and you will not receive the discount. If you haven't yet done so, please register for an account. Once you have registered for an account, you will be able to use any promotion code you have providing you log in first. 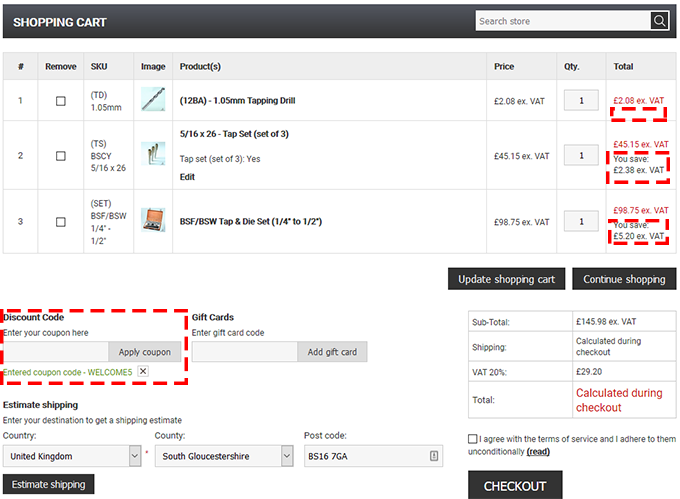 From the Shopping Cart page, before clicking "Checkout", simply enter and Apply the coupon code you have, as shown in the below screen shot. In the above example, you can see that "WELCOME5" has been entered and accepted as a discount code, and the 5% discount has been applied at line level. You don't see the original price, but you can see the amount saved on each line. If the promotion only applies to some items in your cart, then there will only be discounts on these lines. Please note that you can only use one coupon code on an order, so if you have more than one available, pick the one with biggest discount!